β-galactosidases (EC.3.2.1.23), which hydrolyze lactose to glucose and galactose, have two main applications in the food industry: the production of low-lactose milk and dairy goods for lactose intolerant people, and the generation of galacto-oligosaccharides by transgalactosylation reactions. Due to their thermostability, β-galactosidases from thermophilic microorganisms are very interesting for industrial processes, as high temperatures can increase the initial productivity of the enzyme, provide higher solubility of substrates, and prevent microbial contamination. 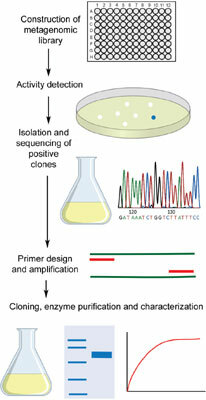 In the past, it was necessary to cultivate and grow thermophilic microorganisms to discover novel thermozymes, but the development of metagenomic techniques has allowed researchers to access the genomic potential of uncultivated microbes and their enzymes. The present review gives a brief outline of thermophilic β-galactosidases, with a special focus on those obtained through metagenomics. Additionally, the sequences of β-galactosidases found in some public metagenomes from hot springs were studied and compared to other known thermostable β-galactosidases. β-galactosidase, lactase, metagenomics, thermozymes, thermostable, GOS.